Supply chain payments company Tradeshift is partnering with MakerDAO to leverage the blockchain to speed up payments, reports Julie Muhn at Finovate. MakerDAO is the creator of Dai, a decentralised stablecoin based on the Ethereum blockchain, as well as the Dai Credit System. Through the partnership, Tradeshift will leverage MakerDAO’s credit system to create a supply chain liquidity marketplace. The marketplace aims to serve businesses, which can leverage transactions and digital assets on the Tradeshift platform to create short-term financing models; developers, who can build apps for investors; and investors, who benefit from the tokenisation of assets such as invoices made available on new financial apps. As Tradeshift co-founder Gert Sylvest describes, it was previously difficult for trade receivables to leverage the blockchain, since the market has tight margins that do not allow for the volatile fluctuations that come with settlement in digital currencies. The difference in the Dai Credit System, Sylvest explains, is that it is “a transparent and stable token that allows anyone to represent real-world currency settlements on the blockchain”. The Dai maintains stability because it is an open smart contract platform that allows anyone to issue Dai against their assets, which are held as collateral. When users want to retrieve their collateral, they return the Dai currency they issued, plus a fee based on how much time they used it for. This removes the need for users to blindly trust a third party. Founded in 2010, Tradeshift helps business’ buyers and suppliers digitise and collaborate on their transactions using any supply chain app. 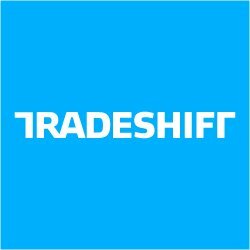 Tradeshift’s business commerce platform connects more than 1.5 million companies across 190 countries. To date, the California-based firm has processed more than half a trillion dollars in transaction value. Tradeshift has raised $432 million, including its most recent $250 million round from Goldman Sachs this spring which vaulted the company’s valuation up to $1.1 billion.